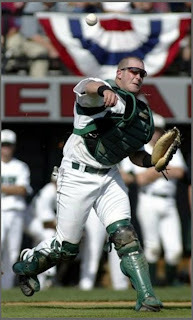 Former 49ers catcher Kris Rochelle has been named an assistant coach for for the 2010 season. He will take over as hitting instructor and work with the catchers and infielders. Rochelle had his pro playing career cut short, playing parts of three seasons of minor league baseball following his 2007 graduation. He joins the Niners after two seasons with the Washington Wild Things and a season with the Oneonta Tigers. “I am extremely fortunate because this was the exact job I thought about getting in the future,” said Rochelle. “It is a little earlier than I expected when I thought about my career, but when the opportunity came, I had to jump at it. "I had young guys behind me playing my position that I coached a little along the way as a player so I think I am ready to work hard at this. I look forward to getting our team on the field and evaluating them and getting ready for the season." Although he was injured as a pro, Rochelle rarely missed a game in college. He is currently tied for eighth on the all-time career games played list at Charlotte, with 215. He caught all but four of Charlotte's school-record 549.1 innings pitched in 2007 as the 49ers finished first in the country with a 2.64 team ERA.